The Rowan or Mountain Ash tree is a medium sized tree growing to between 10m (32ft) to 20m (64ft) high. 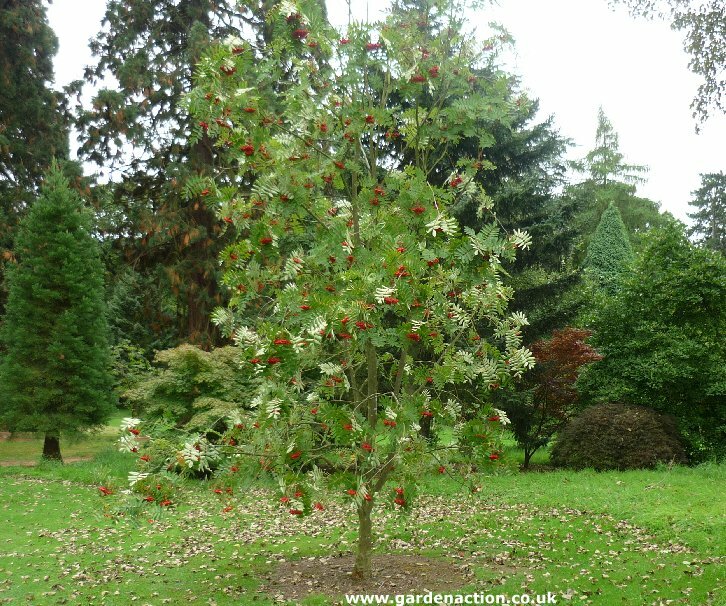 It is a very hardy, easily grown tree with lots going for it. First, let's get the naming of this tree sorted out. In the UK the tree is known as a Rowan. In some parts of Canada it is often referred to as the Dogberry tree. In North America it is most frequently known as the Mountain Ash. The name Mountain Ash comes from the similarity of the the leaves to the Ash tree combined with the fact that Rowan trees frequently grow high in mountains. In fact the Mountain Ash is not an Ash tree at all. For ease of reference, this article will refer to the tree as a Rowan. This is commonly referred to as the European Rowan. It grows to a height of 10m (33ft) to 15m (50ft) and is found all over Europe (especially Northern Europe), North America and in some parts of North Africa and Asia Minor. More information and pictures can be found here. This is called the American Mountain Ash, native to North America and is now widely grown in central and northern Europe. An attractive shrubby tree it reaches a height of 9m (29ft). More information can be found here. This is native to Japan and Korea and sometimes can be found parks and gardens across Europe, North America and Canada. It grows to a maximum height of about 15m (50ft). More information can be found here. Known as the Hupeh Rowan, this is a native tree of western China (Hupeh Province). It is also cultivated in many parts of Europe. It grows to around 10m (32ft) high and is found in many parks and roadsides. More information can be found here. Sargent's Rowan is a native tree from western China often cultivated in parks and public gardens in Europe and North America. One of the smaller Rowan species, it grows to an eventual height of 10m (32ft). More information can be found here. Click here to go to our page which has pictures and short descriptions of the above species of Rowan trees. All Rowan trees are deciduous (shed their leaves in winter) and the dark green leaves first appear in April. This is followed by masses of small white flowers a month or so later in mid to late May. The leaves have a very sweet scent which attracts lots of pollinating insects. 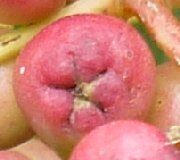 The pollinated flowers turn into berries with seeds in them. Rowan trees start to produce seeds when they are about 15 years old. By late August the berries will have ripened and contain up to eight seeds per berry. Birds love to eat the vitamin C rich berries and they spread them wide and far in their droppings. It's interesting to note that the berries of Rowan trees have a laxative effect thus encouraging the birds to drop the seeds before their digestive system can cause much damage. The seeds of Rowan trees are tough and they require stratification (a period of cold) to break down the coating. Some seeds will germinate the next spring but in come cases the seeds will take two or even three years to germinate. Depending on soil and weather conditions, Rowan trees will have an expected lifespan of 80 years, over 100 years if the conditions are correct. To determine the ideal growing conditions for Rowan trees consider their natural environment. First temperature - Rowan trees are extremely hardy and cope with extremes of cold very well. A coldish winter is good for them. So anywhere in northern and central Europe will suit them. Most areas of Canada and northern and central North America will also provide good weather conditions. The seed of Rowan trees is dropped by birds from the branches of other trees, commonly oaks. 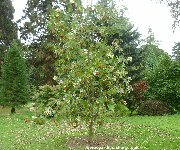 The tree then grows in part shady conditions often under the canopy of other larger trees. Therefore, they prefer a part shady position in the garden. Soil conditions should mimic those found in forests, acidic and peaty soil with good drainage is the ideal soil. Having outlined the ideal conditions, Rowan trees are very tolerant of most conditions and will withstand windy areas very well. Rowan tree require no pruning but if you want a multi-stemmed specimen then simply prune it to the height where you want the multiple stem to appear. These trees are absolutely rock solid and there is very little you will ever do which might kill them. Rowan trees are very strong growing trees and unlikely to suffer from many pests and diseases. Their leaves are not eaten by insects thereby limiting the transmission of disease. Their chief pest is deer, they love the leaves of Rowan trees, above those of almost all other plants. Other less likely pests and diseases include include leaf-mining moths and the apple fruit moth. Lichen grows on the bark but rarely causes a problem. Occasionally canker can cause problems. 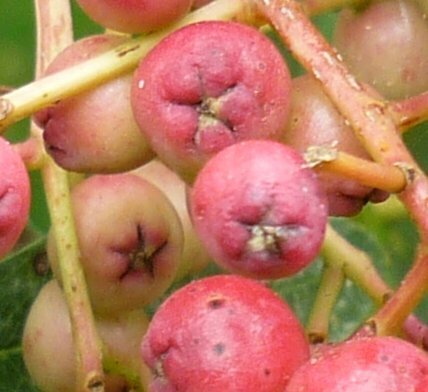 The fruit of the Rowan tree is not poisonous but unless it is over-ripe it has an extremely bitter taste. Let it ripen well though and it becomes much sweeter. There's lots of mythology around Rowan trees, an indication that they have been well regarded for thousands of years. Norse mythology has it that God made woman from the wood of the Rowan tree. The Greek believed that the goddess of youth, Hebe fed the other gods with a magic nectar from her cup which gave them everlasting life. Hebe's cup of nectar was stolen by demons. The Gods decided to send an eagle in search of the demons and to return the cup to Hebe. The demons and the eagle fought each other and in the battle drops of blood and eagle feathers fell to the ground and grew into Rowan trees. The red drops of blood represents the red berries and the eagles feathers represent the leaves of the Rowan tree. If you look at the base of a Rowan tree berry you will often see a five pointed star on the skin. In ancient times the five pointed star was a symbol of protection. Combine this with the deep red of the mature berries, which was the colour indicating protection, then it's clear to understand why the Rowan tree was believed to protect.